Where are bike-sharing companies pedaling to? Following Uber and Didi Chuxing, the sharing economy has moved on to micro-mobility in the shape of bicycle or startups. From Ofo to Mobikes, bicycles have been appearing in massive numbers across cities. They are trying to serve as an important addition in transiting between infrastructure – a mode of transportation that could be used to cover the so-called first or last mile of any trip, such as the distance from home to the nearest subway station. Two unicorns have also rapidly emerged from this micro-mobility space: Ofo and HelloBike both having achieved more than a billion-dollar valuation. But it’s no surprise. After all, there can be no hype without a unicorn. The bike-sharing hype has caught the attention of investors who have poured millions of dollars in capital into the major startups. Earlier this year, Alibaba put its weight behind Ofo – leading a US$866 million fundraising while its competitor HelloBike also managed to raise US$321 million in June from Alibaba’s affiliate Ant Financial. Mobike, on the other hand, was acquired by China’s largest provider of on-demand online services Meituan Dianping for reportedly US$2.7 billion. Using these funds, bike-sharing services have been ostensibly aiming to democratize access to rental bikes by using technology. Bikes now become dockless, tagged with GPS chips which enable them to be rented via a mobile app and removing the need for them to be stored in a central location. This makes them hugely convenient and more economical. At the same time, expansion projects were on the move. In China alone, Ofo and Mobike were expanding rapidly in a relatively unregulated environment, racing to secure dominance by flooding the streets with their bicycles. Beyond China, Ofo has also expanded aggressively in 2017, first moving into Singapore, then the United Kingdom, United States, Australia, France and other countries. As of June 2018, Ofo claimed to have some 15 million bikes in operations in more than 300 cities across 22 countries, as well as 250 million global users. However, now Ofo has hit the brakes and in certain cases backpedaling fast. The Chinese bike-sharing startup has ceased operations in Malaysia last week, about a year since the bike-sharing service expanded into Melaka. Just today, it has ceased operations in Thailand. They have also laid off employees across the board in North America and is dramatically pulling back its US operations. According to Quartz, Ofo told North American team members that they are going into sleep mode. “As part of our focus, we have been working towards profitability and this has meant that some markets have had a change in staff priorities and positions,” said Ofo’s spokesperson. This is a phase to reorganize Ofo’s international market strategy to center their focus on priority countries, which in Asia includes Singapore, Hong Kong, South Korea, and Japan. At the same time, another bike sharing company oBike also ceased its operations in Singapore last June, leaving users in a lurch with millions of dollars in deposit yet to be returned while the service’s 14,000 bicycles remain strewn across the city. In cities around the world, bike sharing companies were struggling with theft and vandalism. 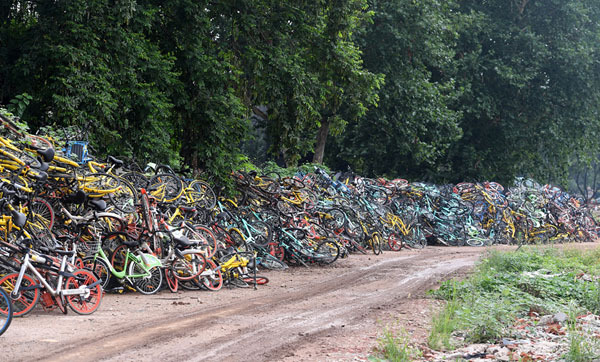 The influx of undocked bikes from Ofo, as well as funded rivals like Mobike and HelloBike, led to huge graveyards of broken, abandoned bike. Dockless bikes have also been found on streets, tossed into lakes or even thrown from buildings. Such vandalism has forced Hong Kong-based bike-sharing startup Gobee to retreat from Europe, before shutting down entirely in July. But more than just vandalism, theft and poorly maintained bikes, the trouble for the bike-sharing company is more than just innovation. It’s about painting the utopian vision of reshaping society to be more caring, cooperative, and trusting.